The number of vacant investor-owned properties in Melbourne remains high, with as many as 16.2 per cent homes sitting empty, according to the latest Speculative Vacancies report based on 2017 water usage data. The proportion of investment homes using less than 50 litres per day – equivalent to the volume lost from a dripping tap – fell from 18.9 per cent in the last report in 2014 as investors sold properties back into the market, the report by think tank Prosper Australia said. The vacancy rate for all properties using 50 litres per day or less was 3.9 per cent, or 60,901, of the 1,579,906 residential properties across 258 Melbourne suburbs in data from providers Yarra Valley Water, City West Water and South East Water. The number of investment properties considered, based on 2016 census data, was just over 422,000. The rate is likely to rise again, Prosper said. Even if the Labor Party wins next month’s federal election and imposes planned changes to negative gearing and capital gains tax deductions, a falling market is likely to push the rate up, as investors buy back in to a falling market, said report author, Prosper project director Karl Fitzgerald. “Vacancies will continue under such high migration levels,” Mr Fitzgerald said. If available, the vacant stock of 21,326 properties using zero litres of water would have boosted the housing stock in the auction market in 2017 by 17.3 per cent, Mr Fitzgerald said. To combat the problem, Victoria should reform its vacant residential property tax to include all vacant land included in the city’s urban growth boundary, and replace stamp duty with a broad-based land tax, he said. Box Hill, Melbourne’s emerging second CBD and an area that has seen a proliferation of high-rise apartment towers in the recent housing construction boom, had the highest number of vacant properties, with 15.4 per cent, or 1521, of its 9863 dwellings vacant. That was the figure for properties using up to 50 litres per day. Absolute vacancies in Box Hill – for properties using no water – were 9.6 per cent, suggesting significant underutilisation. It marks a change from the previous report, in which inner Melbourne’s Carlton and Carlton South had the highest level of vacant properties. The growth of Airbnb and other short-stay accommodation had likely prompted investors to put property into circulation for short-stay rentals, Mr Fitzgerald said. In Box Hill, there could be cultural factors at play, with buyers in a large Chinese population buying and holding property, Mr Fitzgerald said. But the high Box Hill figure could also reflect the slew of new apartments that came into the market that year and were not taken up immediately. State government figures show Whitehorse council region saw an average increase of 590 dwellings per annum between 2005 and 2016, with more than 1600 new dwellings in 2016 alone. Esther Yong, the director of property marketing firm ACproperty.com.au, said it was unlikely investors were buying apartments to keep them empty. “The Chinese there are very money-savvy,” Ms Yong said. Terry Rawnsley, the principal of consultancy SGS Economics & Planning, made a similar point. “I think this data is just reflecting where new housing is being constructed, but not being occupied for long enough for the benchmark of 50 litres being surpassed,” Mr Rawnsley said. “It was such a peak of the market that it’s hard to think why it would take a whole 12 months to lease out a property in such a hotspot,” he said. 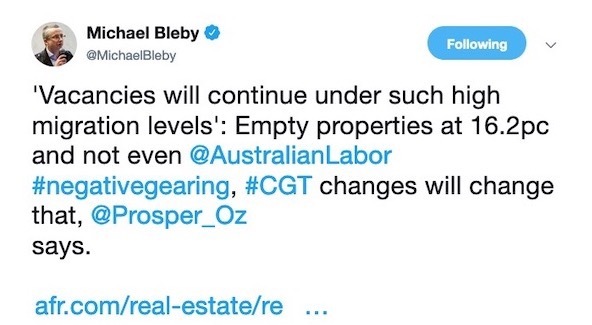 The 16.2 per cent vacancy rate for investment properties was derived by dividing empty apartments among the total number of investment properties – excluding public housing, caravans and coops – to come up with a rate of 12.9 per cent. Adding it to the 3.3 per cent residential vacancy rate figure of consultancy SQM Research came up to 16.2 per cent. corporate sites with a single water meter. Regions with holiday homes that could also distort findings, such as the Mornington Peninsula, were also excluded.